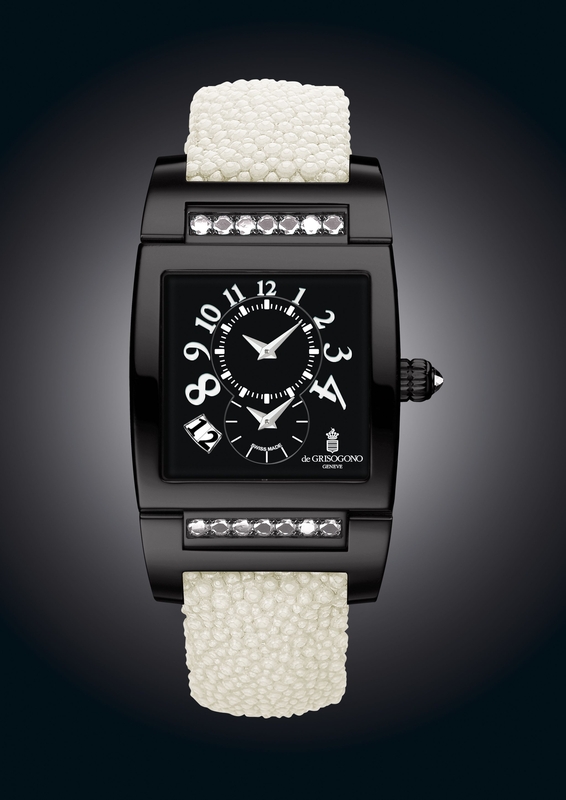 It’s a decade since de Grisogono’s Instrumento N°Uno appeared in the market and since then has witnessed many variations. Now the same is being revisited with a daring, resolutely Pop Art approach. The four designs for women’s watch give pride of place to works of modern art and it is easy to imagine these creations next to the great classics of pop art, namely Andy Warhol or Roy Lichtenstein. A touch of impertinence and a good dose of freshness emanate from the black steel case set with brightly coloured stones, brilliantly matched with shagreen straps and faces enhanced with the same shades. 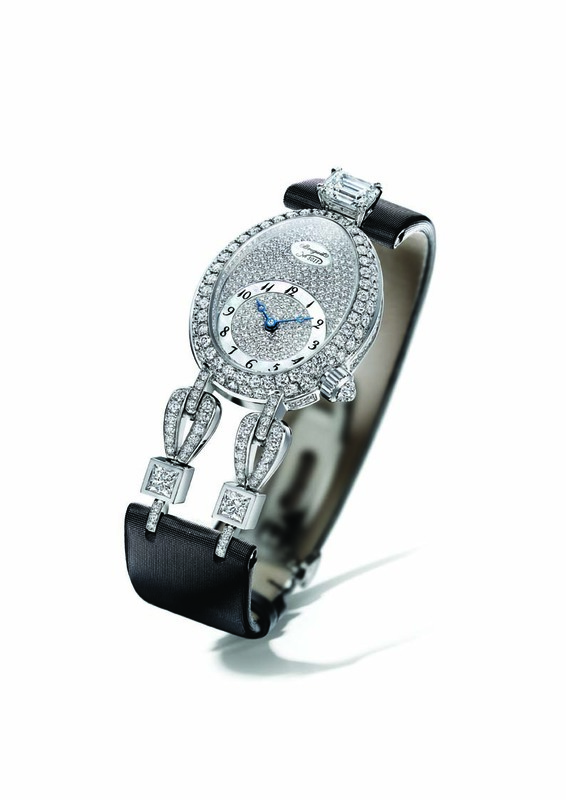 It is a design that embodies a real joie de vivre and makes telling the time always a pleasure. Three shagreen straps in matching colours, enhanced with drops of white gold set with white diamonds, complete this very attractive special edition– the charm of a feminine silhouette wearing such jewels. For him, Instrumento N°Uno takes on a black alligator skin strap perfectly suited to its black matt stainless steel case. An understated and elegant masculine look enhanced with a black lacquered face that sets off the subtlety of the bright and sparkling colours of the pointer, hands and Arab numerals. Green, orange, red… each man can choose the shade that represents him in a style reinvented by de Grisogono. A limited edition of 100 is available in a boxed set of three. A special anniversary deserves a spectacular timepiece. Here Instrumento N°Uno unveils its full strength and adorns itself with a white gold case exclusively set with 240 white baguette-cut diamonds. The face is fully decorated with 148 specimens of the same gem giving it an understated and precious look and emphasising the dual time zone display, in which the hour and minute hands seem to float on an ocean of baguette-cut diamonds. 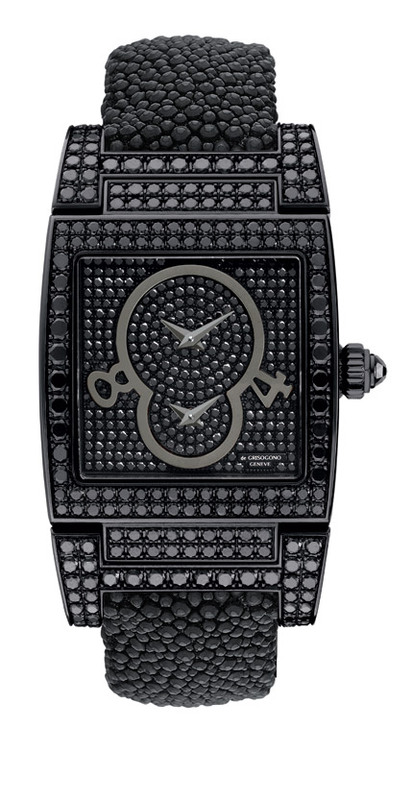 In the first version, this true work of art of watchmaking plays fully on contrasts with the flashing black diamond set on the crown offsetting the black shagreen strap. The second version is mounted on a white gold strap set with 362 baguette-cut white diamonds, some of which are even set in the clasp. Price On request. 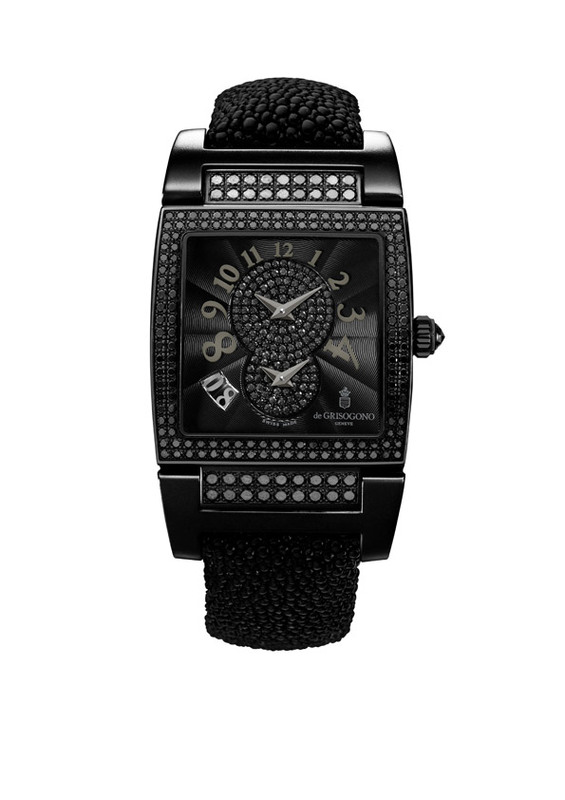 Available at de GRISOGONO Boutique, Emporio Mall, Vasant Kunj, New Delhi. For its 10th birthday, Instrumento N° Uno shows up in vividly coloured versions. On the men’s model, the green, red, or yellow colours of the hands, the Arabic hour numerals and the dual time-zone indices are matched by overstitching in the same shade on the alligator strap. 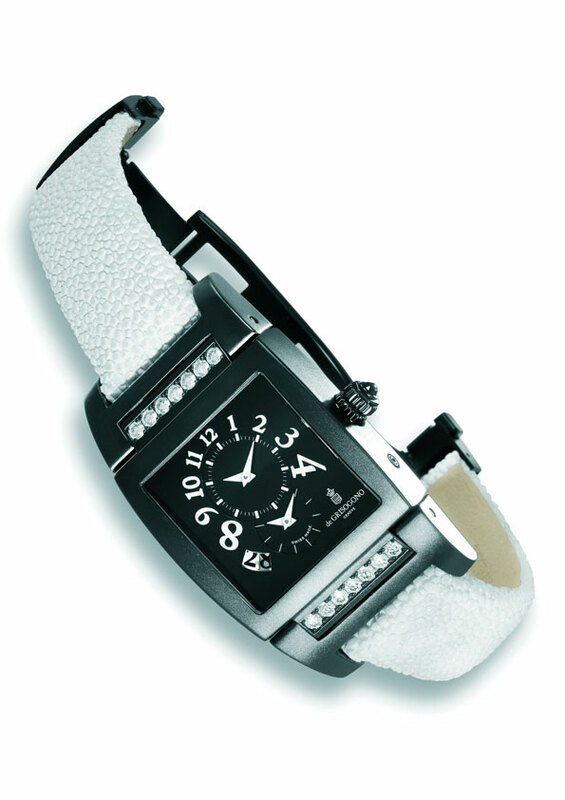 The feminine variations lend a fresh and mischievous touch to the curving square case in blackened steel. The green, blue or pink sapphires set on the case frame dials punctuated with colourful accents and Pop Art style stingray straps. These dynamic, playful design elements enliven an iconic model housing a mechanical self-winding movement that drives two eminently useful and pleasantly readable dual time-zone and large date complications. The flowing lines and harmonious proportions of the Instrumentino express their innate femininity through a new language, that of diamonds and precious stones. Featuring a rainbow spectrum of pink, blue, brown or green sapphires, the dial of this watch epitomising the spirit of de GRISOGONO collections reveals a new facet of its personality through a highly refined burst gem-setting motif. Clothed in this festive garment, the dual time-zone complication beats to the rhythm of a mechanical self-winding calibre, or a quartz movement. This precious watch appears elegantly attired in rose gold, while the more contemporary and sporting chic versions feature steel or PVD blackened steel. It coils gracefully around the wrist with a black, green, blue, white, pink or brown stingray strap matching the gem-setting. An explosive cocktail of technical sophistication, taut lines and high-end finishes, the Power Breaker chronograph launched in 2005 now draws additional strength from the contemporary aesthetic codes of the Formula 1 motor-racing universe. While the case boasting a complex four-part construction – bezel, middle, back and crown guard – remains identical to the original, the dial displays an original sporting dynamic. As it lines up on the starting grid of the race into the new decade, its design highlights the two chronograph counters with surrounds resembling those on a Formula 1 racing car instrument panel. 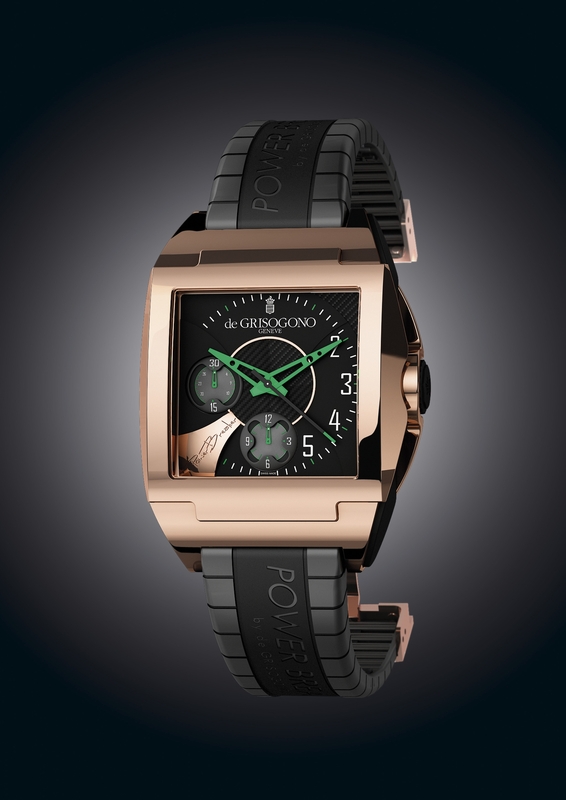 The cut-out, green-tinted hour and minute hands further accentuate the model’s streamlined elegance. This mechanical spirit asserts itself within a powerful rose gold case and its name is hand-engraved at 7 o’clock on a high-tech dial enhanced by an aerodynamic piece of precious metal. First unveiled in 2007, the generous volume, sturdy lugs and cambered lines of the Instrumento Novantatre are lit up with a new radiance this year. 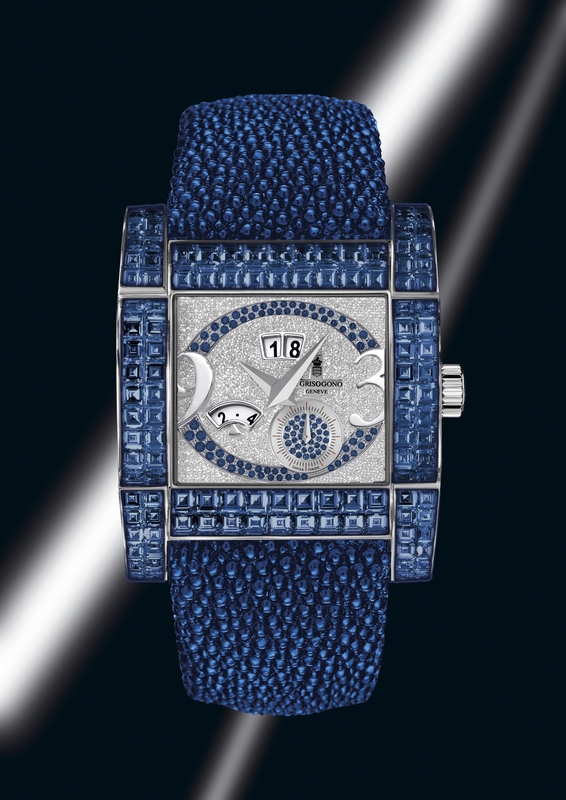 Its distinctive sporting chic case is adorned with baguette-cut rubies, blue sapphires or diamonds. Their meticulous assembly creates a stunning geometrical effect that creates a striking contrast with the gem-setting on the dial. In addition to the oversized 9 and 3 o’clock numerals and the white gold hands, the dial is finely set with baguette-cut black or white diamonds, blue sapphires and rubies. The result is an exquisitely precious stage on which time is played out to perfection, directed by a self-winding movement indicating the date and months in addition to the hours, minutes and small seconds. To enhance the smooth appearance of these new variations, the curve of the watch, both for men and ladoes, is extended by a strap in pink stingray for the ruby version, in blue stingray to match the blue sapphires, or in black alligator leather for the diamond-set version. Released in 2008 and winner of the “Prix du Public” at the Geneva watchmaking Grand Prix awards, the MECCANICO dG has been treated to a glamorous makeover. Distinctly less sporty and more refined, it is transformed into a precious model featuring delicate gem-setting enhancing the technical appeal of its mechanical movement driving a double analog and digital dual time-zone display. By associating the contemporary design of its brilliant or baguette-cut diamond-pavé case with one of today’s most complex movements, the watch achieves a perfect match between watchmaking and jewellery. Its hand-wound movement comprising no less than 651 parts was hitherto available in six versions issued in limited editions of 177. 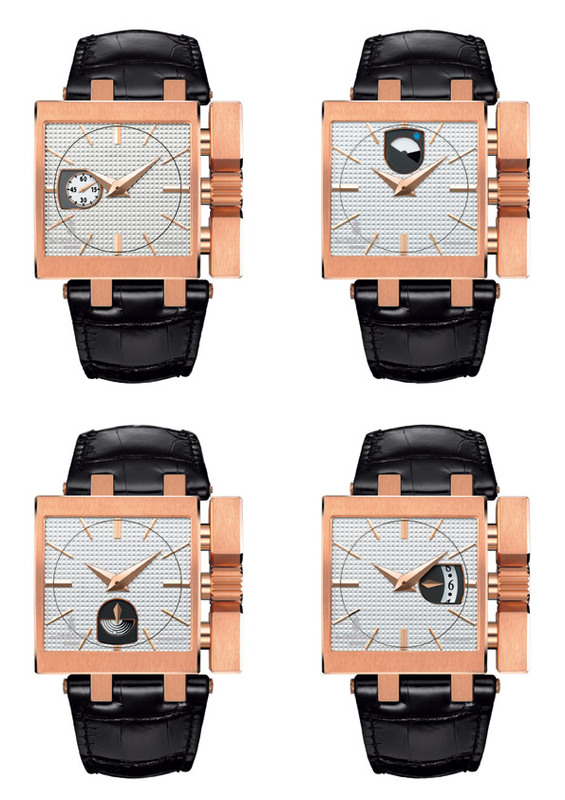 The line is now enriched with these three new rose gold variations set with brilliant-cut black or white diamonds or baguette-cut diamonds, issued in a strictly limited edition of 20. Frequent travellers and everyone who regularly juggle timezones will surely be taken in by the latest de Grisogono collection, Fuso Quadrato (47mm) which features a totally original display of the second timezone function. A diaphragm mechanism hides or reveals it at will with its pair of distinct but equally handsome dials. The diaphragm’s 12 titanium blades can be either open to reveal the second timezone dial or closed to display only the local time in hours and minutes. At the heart of the watch a self-winding mechanical movement beats at 28,800 v.p.h. and provides a 42-hour power reserve. 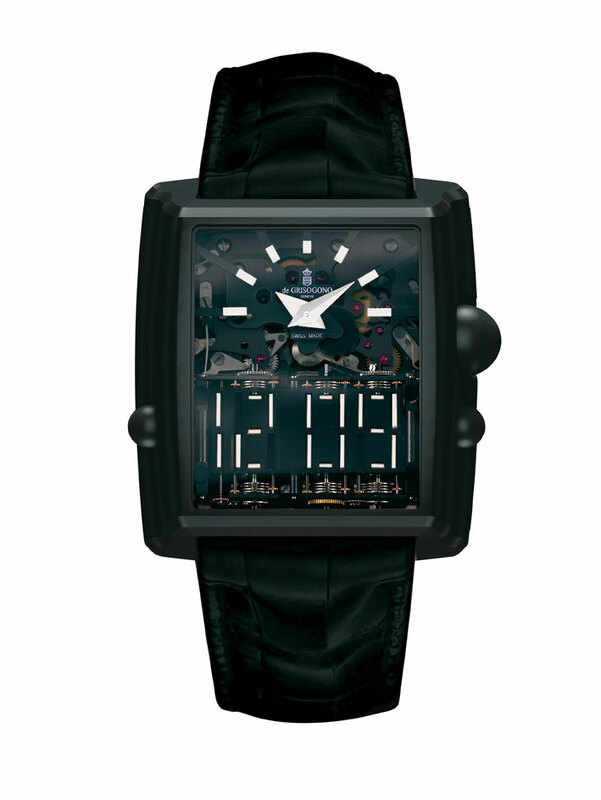 While the hours and minutes of local time are shown by a pair of centre-positioned hands, the second timezone is indicated on a 12 hour dial by a black frame hand. The black upper dial’s centre area is satin-finished while its outer zone is fine-grain sandblasted. The de Grisogono-designed hour markers and applied numerals match the case metal color, as does the lower dial, featuring clou de Paris cobbled finish and a chapter inscribed with hour markers and Roman numerals. 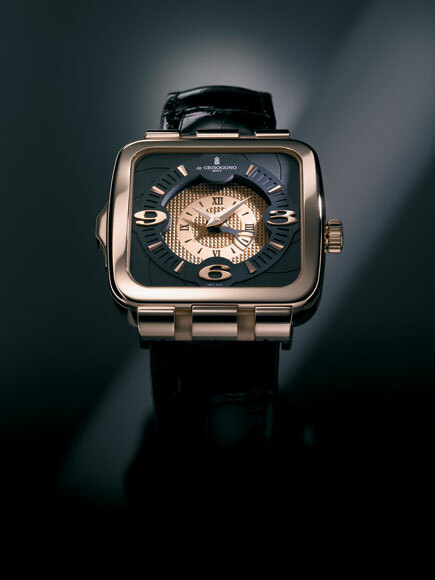 Fashioned in 18K pink gold or white gold, its square silhouette’s sensual rounded lines are delicately arched outward in the 6-to-12 axis to hug the wrist closely, aided by the mobility of the strap lugs. The sapphire crystal itself is curved in harmony with the case profile. Water-resistant to 100 feet), the watch comes with a genuine alligator strap fitted with a triple deployment clasp color-matched to the case. Price: Fuso No1 (Pink Gold) Rs at 23,44,000 and Fuso No 2 (White Gold) is for Rs 24,97,000. Designed to display the time in two time zones, de Grisogono’s Meccanico dG’s ranks as the world’s first watch with a mechanical digital display as well as an analogue face. A single mechanical movement, two time zones, two types of display: the Meccanico dG breaks truly new ground; for the first time in watchmaking history, a digital display and mechanical power come together successfully. A proprietary de Grisogono calibre, its hand-wound movement comprises 651 components. It offers an analogue display of the hours and minutes on the upper dial and the digital display of a second time zone on the lower section. The latter features the tens of hours, the hours, the tens of minutes and the minutes. The mechanism is activated via movable micro-segments driven by a set of 23 cams combined with gears plus a triggering and synchronization device. Meccanico dG has a power reserve of some 35 hours. The latter is displayed by a hand in a 90° sector on the back of the movement and is visible through a shaped crystal caseback giving a glimpse of the brand’s famous emblematic scrolls. The Meccanico dG is water-resistant to 30 metres and comes in a choice of pink gold, titanium, titanium and rubber, titanium and pink gold or titanium and platinum. A crown at 3 o’clock controls the analogue time display. Two correctors serve to reset the second time zone; the left-hand one controls the hours, the right-hand one the tens of minutes and minutes. 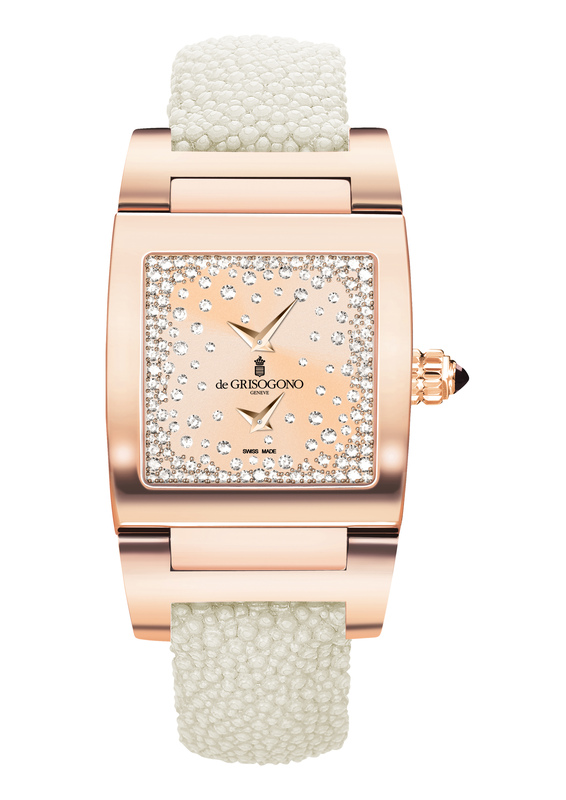 The strap is in natural vulcanised rubber and features a deployment clasp adorned with the de Grisogono emblem. 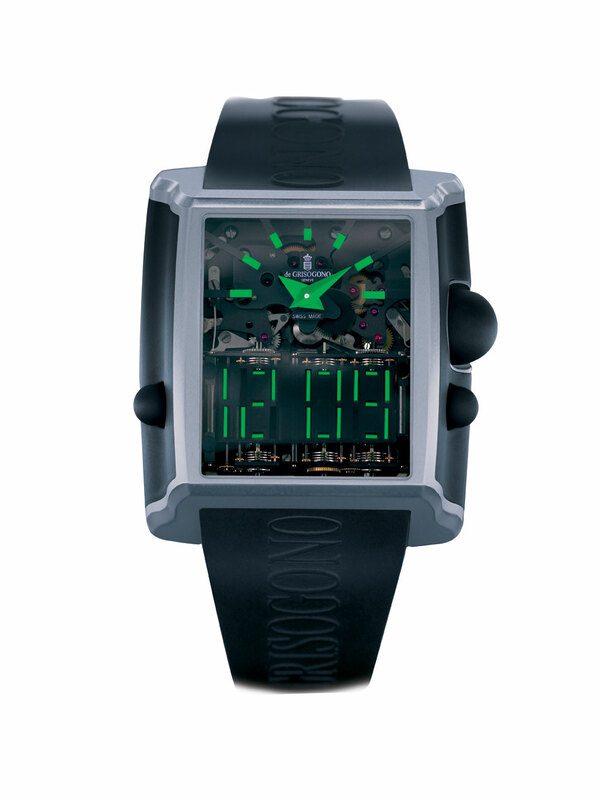 The Meccanico dG is being fashioned in a limited edition of 177 watches. Price : Meccanico N06 (Pink gold and Rubber) Rs. 2,11,50,000, Meccanico N03 (Titanium and Platinum) Rs 2,05,63,000 and Meccanico N02 (Titanium and Rubber) Rs 2,00,00,000. 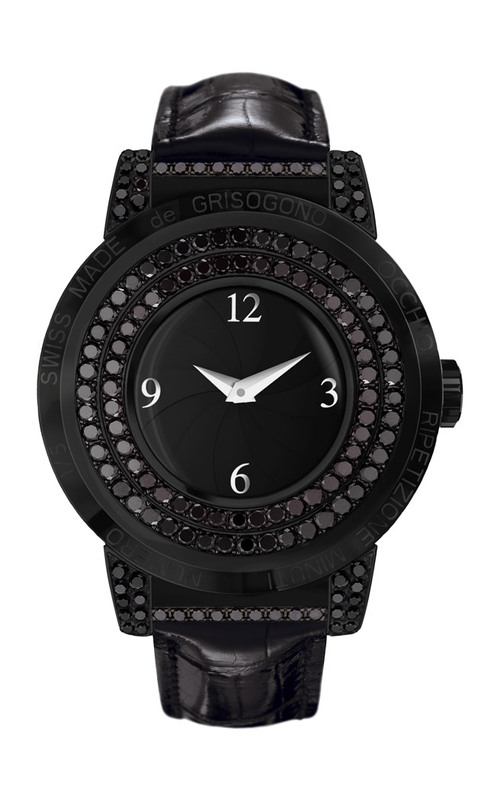 Available at de Grisogono Flagship Boutique, Boutique N211, Upper Grnd. Flr., DLF Emporio, Nelson Mandela Rd., New Delhi 110070. Ph. 91 11 4609 8271.